Elmo and Zoe head to the zoo in Sesame Street: Elmo’s A-to-Zoo Adventure, where they explore exciting zoo habitats and play games based on a variety of literacy skills. Players learn such skills as letter identification, letter sounds and word families in the Aquarium, Savanna, Jungle, Wetlands and Arctic habitats. Elmo’s A-to-Zoo Adventure encourages literacy skills, including letter identification, letter sounds, and word families, through engaging and fun mini-games. Explore exciting Zoo habitats including the Aquarium, Savanna, Jungle, Forest and the Arctic. Easy to follow audio-visual directions that preschoolers can master on their own. Use the second Wii Remote™ to drop-in and assist your child when needed. Game difficulty adapts to your child’s level. Customize up to four profiles, set functions including difficulty level and game limits, and review the games and educational content your child has played on the Parent’s Page. Wii and Nintendo DS versions include Game play Helpers to simplify game play for your preschooler. The Wii game play helper is a soft and fuzzy character cover with special grips that slips over the Wii Remote, minimizing unnecessary buttons and making it easier and more fun to hold. For Nintendo DS, there is a jumbo click stylus designed for smaller hands, simplifying interaction with the touch screen. Fun, education and accessibility are combined with the unique offering of game play helpers, available for Wii and Nintendo DS systems at no additional charge. On Wii, the exclusive game play helper is a soft and fuzzy Elmo or Cookie character cover with special grips that slips over the Wii Remote, minimizing unnecessary buttons and making it easier and more fun to hold. For Nintendo DS, there is a jumbo click stylus designed for smaller hands, simplifying interaction with the touch screen. We had the opportunity to review the Sesame Street: Elmo’s A-to-Zoo Adventure on WII. My daughter (who is 4) was so excited! It comes with an adorable WII controller cover. This is great accessory for preschoolers. They love that this makes the controller “theirs”. Mom and Dad can not play a controller with Elmo on it. (according to my 4 year old). Elmo’s A to Zoo Adventure has MANY fun and learning games that kids can play. 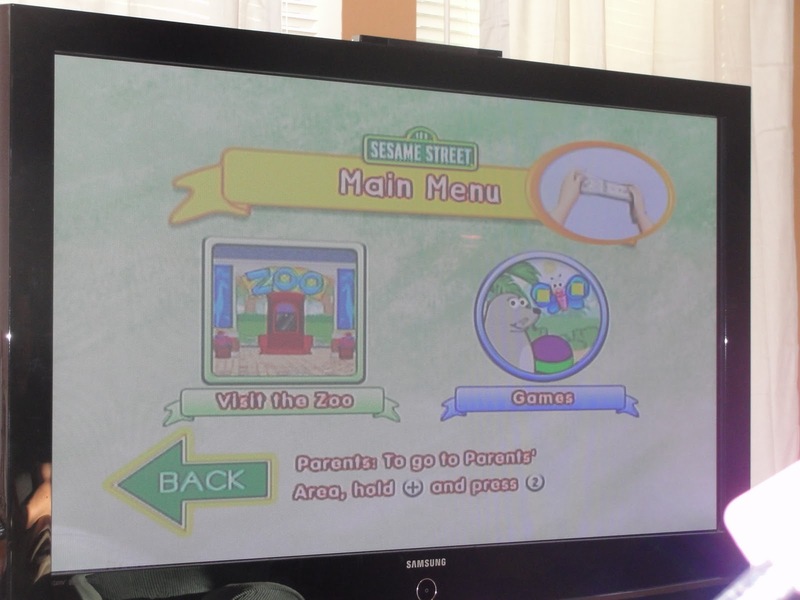 The main menu allows you to “Visit the Zoo” or go straight to certain “Games”. It is very easy to navigate. 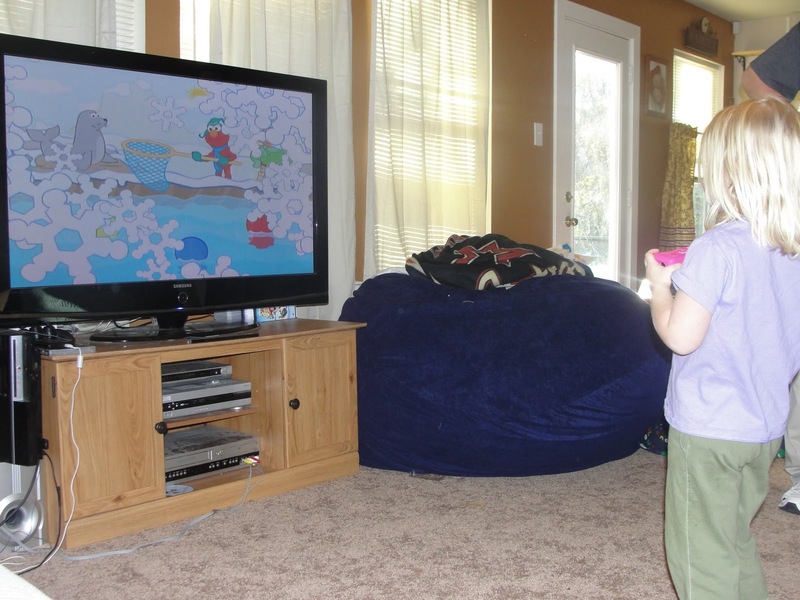 She was able to use the WII controller to quickly find the game that she wanted to play and get right to playing. There are many educational games on Elmo’s A to Zoo Adventure. One of my daughter’s favorites was the one in the picture below. This game would show a letter in uppercase and tell you to find the letter in lower case. When she saw it she was to help Elmo pick it up with his stick. She loves this! I love that it is fun and entertaining as well as educational! Here she is helping Elmo catch the lower case “e”. Below is another game that requires you to help Elmo find a shape that matches his shape. She would help him catch it in his net when the correct shape was in front of him. 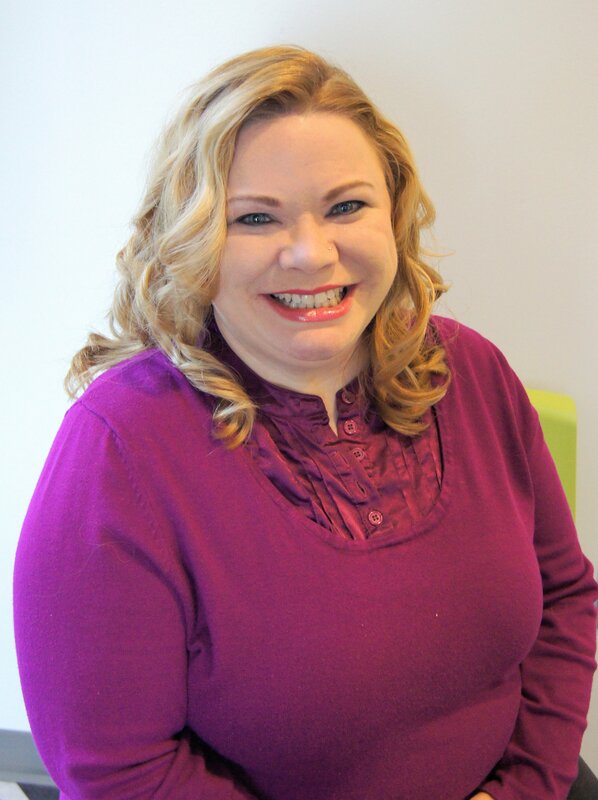 The games are entertaining and intuitive, enabling preschoolers to play by themselves with minimal involvement and also offer ways for parents to help without interfering. The games feature a “Parent’s Page” where parents can review games their child has played along with relevant curriculum for each. Using this option, parents can customize up to four profiles and set functions such as game time limits. I love this “Parent’s Page” feature! And I love that my daughter can play this independently. All kids love Sesame Street! I am so thankful to Warner Brothers for creating a source of fun and entertainment through these games! I love that these have a purpose rather than the many mindless game that are available for our kids. Here is a super cute video courtesy of Warner Brothers. Sesame Street: Elmo’s A-to-Zoo Adventure is rated “EC” for Early Childhood. For more information on Sesame Street: Elmo’s A-to-Zoo Adventure please visit http://www.sesamestreetvideogames.com/. Sesame Street: Elmo’s A-to-Zoo Adventure for WII is only $28.34 on Amazon right now. And Sesame Street: Elmo’s A-to-Zoo Adventure for Nintendo DS is only $19.79 on Amazon right now. These prices are incredible. I suggest snagging them at this price. It is the best price I have found for them online. Now you can win Sesame Street Elmo’s A-to-Zoo Adventure! The winner can choose the between DS or WII verson of the game. 2.Tell me if you would like this on Nintendo DS or Nintendo WII if you win. $3 off Huggies Coupon – Get it while you can!